Happy Wednesday. I'm Jessica Menton, walking you through today's premarket action as stock futures edge down. Energy shares, which helped boost major averages Tuesday, are in focus again this morning as traders await weekly data on U.S. oil inventories. Investors are also sorting through just-released earnings from home builder Lennar. Yoga-gear maker Lululemon will open its books after the closing bell. Plus, our Kirk Maltais weighs in on why the prices of U.S. hog futures have rallied over the past month. Global stocks moved lower Wednesday amid lingering concerns around the possibility of a global economic slowdown. U.S. hog futures prices have rocketed nearly 50% higher in the past month, lifted by rising Chinese imports of American pork to cover a supply shortfall. 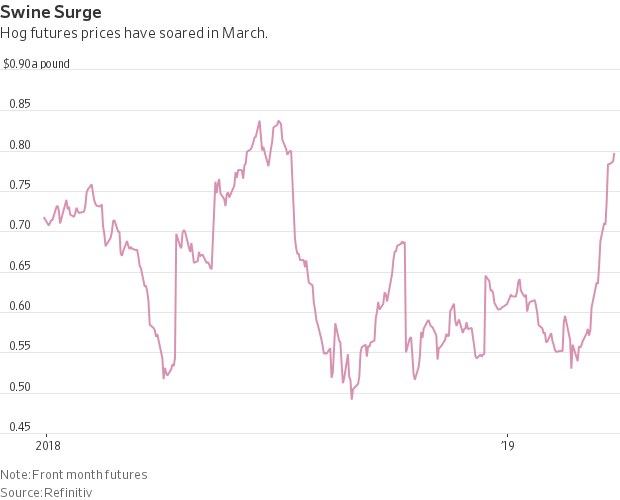 April prices of U.S. lean hog futures on the Chicago Mercantile Exchange have risen 43% since the beginning of March, on track for their best monthly performance on record based on data going back to 1973, according to Dow Jones Market Data. Hog futures are one of the best-performing assets this year—just behind gasoline and U.S. crude—across commodities, stocks and currencies. The broader S&P GSCI commodity index has climbed 16% early this year. Hog prices have surged in recent weeks on signs that Chinese buyers have turned to the U.S. to make up for dwindling pig herds because of African swine fever. Outbreaks of the disease—which is deadly to pigs but not harmful to humans—started last year. Analysts’ recent estimates show Chinese pig farmers have culled at least 10 million sows in an effort to halt the spread of the fever, with Chinese hog production running roughly 30% lower than last year. China is the world’s biggest producer and consumer of pork. According to figures from the U.S. Department of Agriculture, China produced as many as 710 million hogs in 2018—and consumed nearly 56 million tons of pork, nearly half of all pork produced worldwide. The nation is buying from the U.S. despite the 62% tariff China imposed last year on American pork imports. Earlier this month, the USDA confirmed that China bought 23,800 metric tons of pork from the U.S.—the country’s largest U.S. pork purchase since April 2017—followed by a second, smaller purchase of 3,000 tons that officials confirmed last week. Investors and pig farmers will look to see whether U.S. and Chinese officials reach a resolution to the countries’ prolonged trade dispute. U.S. Trade Representative Robert Lighthizer and Treasury Secretary Steven Mnuchin are set to meet with Chinese Vice Premier Liu He in Beijing this week. President Trump and Chinese President Xi Jinping are aiming to reach a trade deal by the end of April. About 6.45 billion shares changed hands on exchanges operated by the New York Stock Exchange and the Nasdaq Tuesday, the second-lowest number so far this year. Shares of Facebook have surged 28% in the first quarter through Tuesday, on pace for their best quarter since the third quarter of 2013, according to Dow Jones Market Data. On this day in 2000, technology stocks set a record for industry representation in the S&P 500 at 34.9%. Meanwhile, Cisco Systems became the world’s most valuable company, with a market value of $548 billion. Never before had any industry sector accounted for so much of the stock market and never had a company become the world’s largest in so short a time. Over the next year, however, tech shrunk to just 17% of the broad index, as tech stocks lost more than half their value. Cisco shed more than $425 billion—the fastest and biggest fall in market value any stock had ever suffered. The U.S. trade deficit for January, released at 8:30 a.m. ET, is expected to narrow to $57.4 billion from $59.8 billion a month earlier. Crude-oil inventories are scheduled for 10:30 a.m. Government data are expected to show U.S. stockpiles fell by 400,000 barrels last week, according to the average target of nine analysts and traders surveyed by the Journal. The Kansas City Fed’s Esther George speaks on the economy and monetary policy at 7 p.m.
Equifax and FICO are teaming up to sell consumer data. 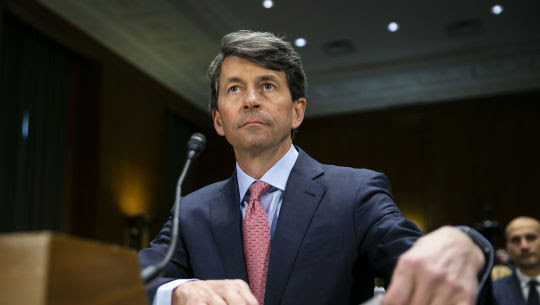 Two consumer-credit giants plan to start working together to sell consumers’ data to banks, the latest attempt to feed banks’ appetite for more information on customers. Lyft will price its shares above their target range for their initial offering. Lyft is expected to price its shares above the targeted range of $62 to $68 for its IPO, in a sign of strong investor demand ahead of the ride-hailing service’s debut. China’s oil futures are giving New York and London a run for their money. A year after China rolled out yuan-denominated oil futures to shake up the global crude market, trading in the new contracts is gaining ground on rivals in London and New York. Cash-strapped Illinois and Chicago will borrow billions. Illinois and its biggest city are on track to borrow hundreds of millions of dollars starting this week, a test of investors’ willingness to lend to stressed governments prone to spending more money than they bring in. Magical thinking about unicorn IPOs. Investors used to complain that all the good companies were staying private, giving the ordinary shareholder no chance to buy their stock. Be careful what you wish for: Now there’s a stampede of technology unicorns IPOing. European banks face a triple whammy. Plunging bond yields have made life difficult for bank investors everywhere. For Europe’s beleaguered lenders, it is heaping pain on an already tough situation. Real-estate funds have a problem: too much cash. Private real-estate fund managers, sitting on record amounts of cash, are finding it increasingly difficult to spend all that money within the deadlines they promised investors. Centene will buy WellCare in a deal valued at $17.3 billion. Centene is buying government-sponsored health-care provider WellCare Health Plans in a cash and stock deal for $305.39 a share. Apple: The technology giant late Tuesday won a ruling from the U.S. International Trade Commission that found Apple didn't infringe on a Qualcomm patent in its iPhones. A judge ruled in a separate claim earlier Tuesday that Apple had violated a patent held by the chip maker. Boeing: A Southwest Airlines Boeing 737 MAX jet made an emergency landing in Orlando after an engine problem. A spokeswoman for Southwest said the problem wasn’t related to the computer system. DowDuPont: Dow will take DowDuPont's place in the Dow industrials before the start of trading on April 2, S&P Dow Jones Indices said Tuesday. The move comes ahead of DowDuPont's plan to spin off Dow as a separate company next month. Shoe Carnival: The footwear retailer's fourth-quarter earnings beat Wall Street estimates. KB Home: The home builder posted earnings for the latest quarter that missed analysts' profit expectations. J.C. Penney: The department-store operator named Bill Wafford as its chief financial officer, effective April 8.